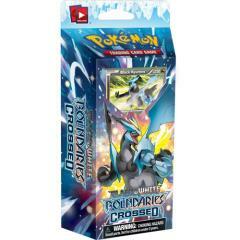 Enter the next dimension of your journey into battle with the Pokémon TCG: Black & White-Boundaries Crossed expansion! This Pokémon Black Version 2 and Pokémon White Version 2 video game-themed expansion includes a powerful mix of new Pokémon-EX, such as the Boundary Pokémon Black Kyurem-EX and White Kyurem-EX, along with Celebi-EX, Cresselia-EX, Landorus-EX, and Keldeo-EX; and features new forms, new Trainers, and new locations to enhance your deck! Black & White-Boundaries Crossed also introduces four never-before-seen ACE SPEC cards that are so incredibly powerful, players can only carry one into battle! Some ACE SPEC cards found in the expansion have a unique game-mechanic that only works when attached to a specific Pokémon such as Black Kyurem-EX or White Kyurem-EX. ACE SPEC cards also feature a unique card face with a tinsel foil.